Thursday's episode of Naruto Shippuden will be the finale of the Itachi Shinden saga, which has served as pretty nice appetizer for future canon-based episodes. 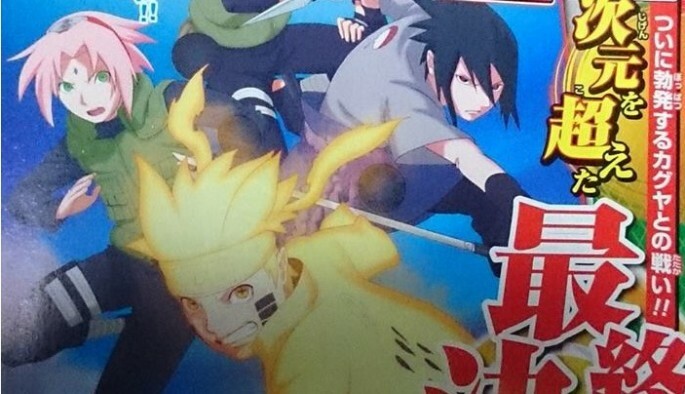 The next story arc focuses on Naruto, Sasuke, Sakura and Kakashi (the members of the original team 7) as they prepare for their final battle with the mother of all shinobi - Princess Kaguya Otsutsuki. Teaser scan for the upcoming saga has already been released last week. It featured Kakashi (no longer with a Sharingan), Sakura, Sasuke and Naruto in his sage of the sixth paths mode. Also, a new opening for Naruto Shippuden will be making its debut on May 5. Performed by Asian Kung-Fu Generation, their song 'Blood Calculator' will be the 19th opening for the Naruto Shippuden anime series. -After activating the infinite Tsukuyomi, Madara shifts his attention on dispatching the survivors of the powerful jutsu. Kakashi, Sakura, Sasuke and Naruto find themselves the only ninjas left in their battle against the legendary Uchiha ninja, who appears to have become more powerful with two Rinnegan eyes. -Black Zetsu will turn on Madara by stabbing him from behind. The creature will reveal its true identity as the will of Kaguya Otsutsuki - the mother of the sage of the six paths. -A huge amount of chakra will start bursting out of the ground. Black Zetsu will then transfer himself to Madara, paving the way for the revival of Kaguya - the strongest chakra user of all and the final villain in the Naruto anime series. -With Kaguya's return, the final showdown between good and evil commences. If you can wait for the Kaguya arc saga to start, Naruto Shippuden: Ultimate Ninja Storm 4 includes the ending of the Naruto series, including Team 7 battle with Kaguya. Xbox upgrade rumors: New console coming sooner than expected? 'Dancing with the Stars' season 22 week 5 spoilers: Jodie Sweetin to miss Monday's performance?